10. Citric Acid - The most common preservative in the US. This chemical compound makes the environment acidic to prevent or slow bacterial and mold growth. This is a compound that occurs naturally in the body (an intermediate of the Krebs Cycle) and so does not harm us as we ingest it and is approved by the FDA. 9. 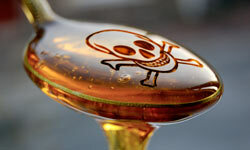 High Fructose Corn Syrup (HFCS) - The most common Image courtesy of IStockPhoto user profetasweetener in the US. Pick up a processed item in the grocery store and you'll be hard pressed not to find this in the ingredient list. HFCS is a sweetener that is cheap to make, just as sweet as sugar, and helps preserve the shelf life of foods. HFCS is also closely linked with obesity (largely due to the fact that it is most prevalent in high-calorie foods that contain few nutrients). 8. Caramel Color - This food coloring additive helps the food we eat to look appetizing. This additive does not affect the nutrition profile of the food. 7. Salt - The spice of life, literally. This seasoning is used left and right in fast food to make the meals more palatable. Salt is a natural compound, but unfortunately has shown to increase blood pressure in studies time and time again. 6. Monosodium Glutamate (MSG) - This form of glutamate enhances flavors that already exist in food and does not have its own distinct taste. While questions have arose regarding the safety of MSG and its interactions with brain tissues, the FDA has determined that it is "safe when consumed at levels typically found in cooking and food manufacturing". 5. Niacin - The most common nutrient. Well it looks like number five is one for the books. This nutrient, also known as Vitamin B3, is added back to the buns and bread of fast food products after the processing stripped them of their initial nutrients. Niacin is a water soluble vitamin that can be found in poultry, fish, lean meats, nuts, and eggs. 4. Soybean Oil - Soybean oil is a fast-food staple that is used for deep-frying menu items. Traditionally soybean oil has had to undergo hydrogenation to increase its shelf-life, loading it with trans fats. But newer technologies have allowed processors to skip this step and leave the mostly monounsaturated fatty acids as the source of fat in the oil. 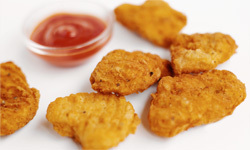 While some fast food establishments have been slow to adopt the new oils, many have seen it as a way to wipe their slate clean of trans fats on the menu. 3. Mono- and di-glycerides - These are a food additive that emulsify liquids to allow smooth mixing of ingredients, and to stabilize food. These compounds are "generally recognized as safe" by the FDA and while they add no nutrients to the diet they are a source of fat in foods. 1. Chicken - Chicken is an option in all types of meals, from sandwiches, to wraps, to salads, to nuggets or strips, and everything in between. Consumption of chicken has nearly doubled since 1970, and no matter which way you order it, your chicken is sure to be combined with several of the ingredients on this list, along with hundreds of others before making it's way onto your plate. The top ten ingredients in fast food. Interesting, huh?